Once upon a time there were two star crossed lovers who fell in love, defying the battle lines of their families, who ultimately did the only thing that could save their frowned upon love: suicide. Romeo and Juliet is quite possibly one of the most accessible and well-known of all of William Shakespeare’s plays. And everyone does it. In The Cradle Theatre Company's production of teen angst drama, the action is brought to the sixties. Directed by Rebecca Etzine, this production of Romeo and Juliet unintentionally highlights all the wrong things. First up is the immaturity of the titular characters. Young boy sees young girl and bang, instant love. Etzine didn't display the love at first sight but rather making it appear as "I'm a horny boy in the age of free love and you're a hot girl, so I'm gonna meet you." As this story develops, Romeo and Juliet don't care about the stakes of family lines, they just want each other. By setting this version in the 60s, Etzine had the stunning possibility of playing into the high stakes of Vietnam and the draft and what that could mean for Romeo to defy his responsibility. She touched upon the war with Tybalt. But that was it, forcing the puppy love to be incidental and bland. The pieces of a brilliant concept had been planted, Etzine’s executions did not allow the conceit to into fruition. Costumes don't solely sell it. The second discovery was just how dumb and careless Friar Lawrence is. Boy did that guy mess everything up! Etzine and actor David G.R. Brummer played with the idea that he was the man of brilliant plans. And after a series of unfortunate events, he just brushed it under the rug. Oops, two kids are dead, y'all should just be friends cuz you have something to bond over now! Not all actors can do Shakespeare. It takes a certain actor who can not only grasp the text but perform it. There is a difference between acting Shakespeare and just reciting it. This company was filled with many reciters, but the ones who truly understood the text and created a character, they were the ones to watch. The strongest actor on the entire stage was Alexandra Gellner as the Nurse. Gellner gave a potential one-off character life. The depth and heart Gellner discovered in the Nurse was incredible. She was more of a mother to Juliet than Lady Capulet. Darby Davis as Mercutio put an oomph in his step. With the largest personality on stage, Davis transformed Mercutio into the coolest dude ever with some sweet moves. Though believability of age made no difference to this production, Patrick Simas as Lord Capulet proved his Shakespearean worth. He made strong choices that irked the wills of the audience in a captivating manner. All he did was raise his hand and he evoked a reaction. Hunter Scott MacNair as Tybalt played the intensity card from start to death. Though it was merely touched upon, playing the military aspect was a strong choice. 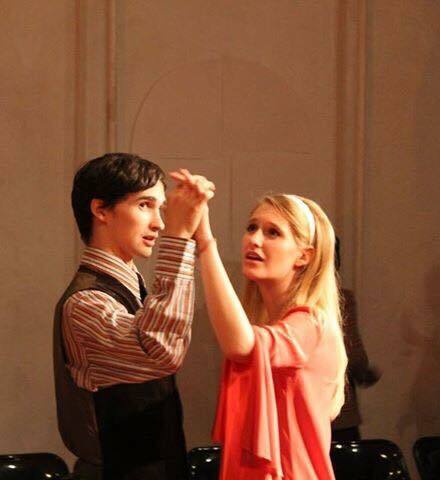 As Romeo and Juliet, Dylan Ungaretta and Juliette Kessler were perfectly youthful. Ungaretta was energetic and carefree. Kessler looks the part. But that's about all that worked. Ungaretta and Kessler lacked chemistry and the ability to make you care about their love. The not everyone can do Shakespeare theory was in full effect with Sam Kessler doubling as Paris and Lord Montage. Sam Kessler proves just how boring and bland Paris is, yet Kessler still gave him the personality of a cardboard cutout. The remainder of the cast were certainly capable performers but by no means do you ever adlib the Bard. There was one frequent culprit who really stopped the momentum of the show. The staging Etzine presented was quite awkward. Performed in a rehearsal studio, just because you have the space doesn't mean you can use it all and run around in each scene. With such large movement, the journey of each scene was lost. The balcony scene was the sole moment that had personality. There's a line from The Producers: "you've heard of theater in the round? You're looking at the man who invited theater in the square! Nobody had a good seat!" Boy was this true! The site lines with the seats among the walls forced certain audience members to miss entire scenes. While the seating may have been the reason for the full stage usage, it truly hurt the show. Attention to detail is key. Especially when it's big. Whether it was Juliette Kessler's mistake or Etzine’s lack of warning, Juliet kept her wedding ring on after she was wed to Romeo. Meaning mommy, daddy, Nurse, et all had to pretend to not notice the bling shining off her ring finger when they were telling her she was marrying Paris. It's moments like this that can hurt a show real good. The costumes by Danielle Santos surely offered the 60s vibe. Romeo began Act I looking and acting like Jim Morrison. By Act II his maturity must have changed as he looked like Andy Warhol. It was so jarring, the audience laughed. Why now and why this are important criteria when creating art. The Cradle Theatre Company’s production of Romeo and Juliet proved there were no real reason besides "why not?"